portions are intentionally blacked out to stop industrial espionage. Haswell Die Configuration shows it divided into 2 main categories, 4+3, 4+2, 4+1 and 2+3, 2+3 ULT, 2+2, 2+2 ULT, 2+1. 4+2: This Haswell Die Configuration is for high-end desktop products such as 4770k. Includes the usual 4 cores, 8mb l3 cache and GT2 display. 4+1 (The Mysterious Die): This one is a bit of mystery. GT1 is used by Pentium and Celeron however this die shows 4 cores and 6MB L3 cache. We cant think of any products that have this. This could potentially be a new product launching soon. Haswell Quad Core Pentium with GT1 GPU? Hmmmmm. 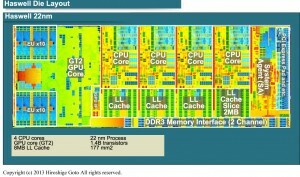 cores with 4 mb of L3 Cache. Would represent products such as i7-4558u. 2+2: Low to Mid End Mobile Processors. Features GT 2 Tech with 2 cores and 3mb worth of cache. 2+1: Pentium and Celeron Processors such as G3430 with GT1 GPU Tech, 2 Cores and 3mb of cache.